We often take for granted the ability to walk into our homes at night and flip on a switch to have light, but imagine what nighttime would be like without this luxury. The LuminAID inflatable solar light was designed as a solution to the need for light post natural disasters, specifically the January 2010 earthquake in Haiti. Designers Anna Stor and Andrea Sreshta were on a school trip to Japan when they unexpectedly found themselves in the middle of the March 2011 Tohoku earthquake. The two friends witnessed firsthand how such a terrible disaster impacts the community, and from this experience they were motivated to make a product that would help those affected by disasters, crises, and conflict. 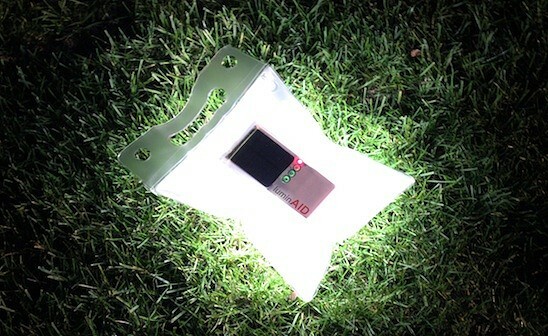 The solar-inflatable technology developed by LuminAID Lab is patent pending both in the US and internationally through multiple filings that cover a broad range of applications and uses, with the LuminAID light being the first application of this technology. The product packs flat and inflates to diffuse the light like a lantern and reduce the glare of the extra bright LEDs. For every eight small, conventional flashlights you pack, you can pack and ship approximately 50 LuminAID Lights. This affordable, renewable, and extremely powerful light is designed with your safety in mind and provides a beacon of hope for disaster victims. We often take for granted the ability to walk into our homes at night and flip on a switch to have light, but imagine what nighttime would be like without this luxury. The LuminAID inflatable solar light was designed as a solution to the need for light post natural disasters, specifically the January 2010 earthquake in Haiti. Designers Anna Stor and Andrea Sreshta were on a school trip to Japan when they unexpectedly found themselves in the middle of the March 2011 Tohoku earthquake. The two friends witnessed firsthand how such a terrible disaster impacts the community, and from this experience they were motivated to make a product that would help those affected by disasters, crises, and conflict. The solar-inflatable technology developed by LuminAID Lab is patent pending both in the US and internationally through multiple filings that cover a broad range of applications and uses, with the LuminAID light being the first application of this technology. The product packs flat and inflates to diffuse the light like a lantern and reduce the glare of the extra bright LEDs. For every eight small, conventional flashlights you pack, you can pack and ship approximately 50 LuminAID Lights.